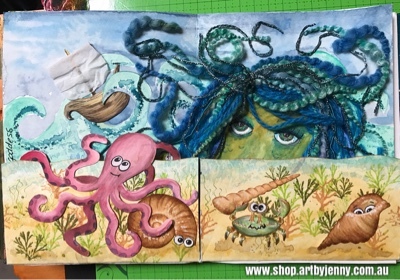 Calypso was my inspiration for my art journal page. 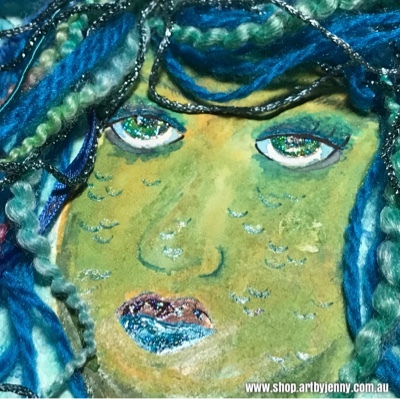 She is a Sea Goddess well known for sinking ships, making big waves in stormy seas and putting curses on pirates. The theme "goddess" was for Tash's journal - part of the AAJS. 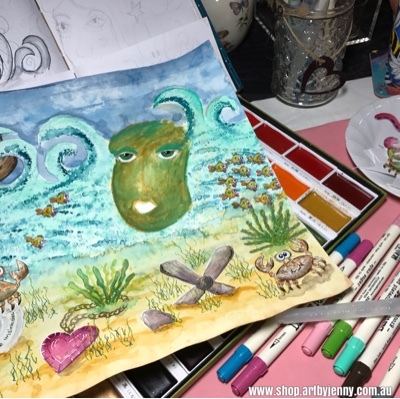 This first photo is a work in progress pic with my original sketch behind. 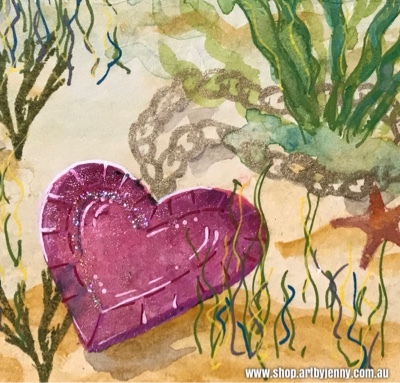 I used my favourite paints Tambi Gansai and the Distress watercolour markers with a few other arty treasures. 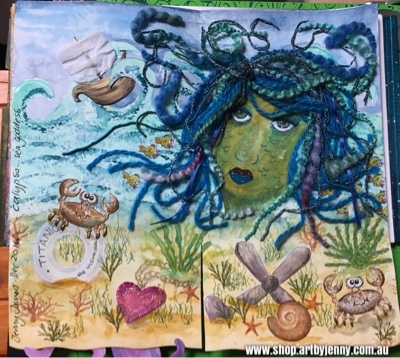 Every sea has a Heart of the Ocean hidden somewhere... this gem is wrapped around seagrasses, watched over by big mud crabs. Sparkle added with Wink of Stella clear shimmer paint pen. 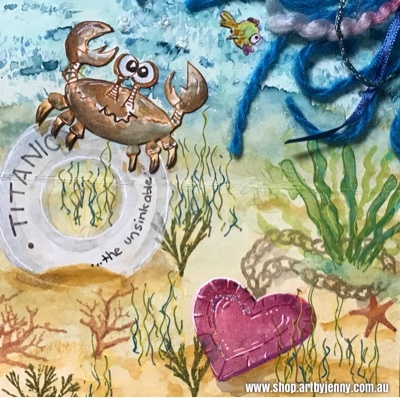 Details throughout the page were added using black and white waterbased Sharpie paint pens along with Stella in gold and white. Stamps were used for some critters and seaweed. 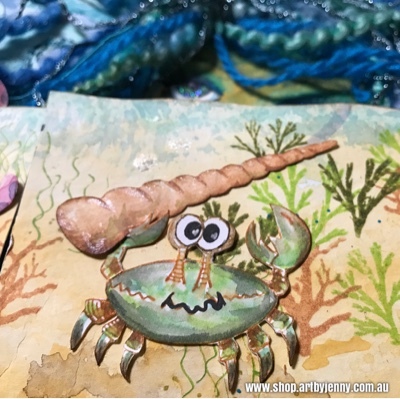 The crabs are from Under the Sea and school of tiny fish are from Ocean Backgrounds, both by Dyan Reavely, while the shells and seaweed are by Rachel Greig of Darkroom Door. 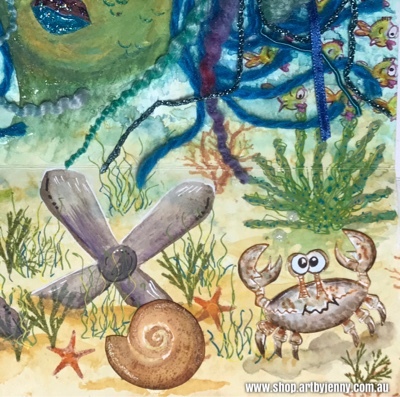 The fish, crabs and shells were all inked with markers then coloured with paints before bring cut out and stuck in the page. 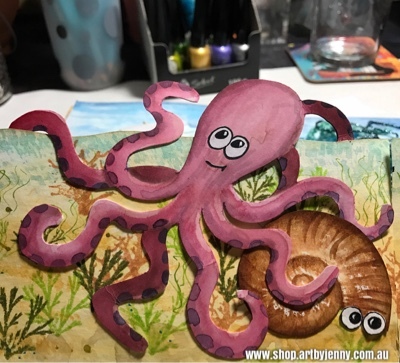 This octopus was drawn and painted freehand, cut in a way that enabled him to climb over the shell and page edge. 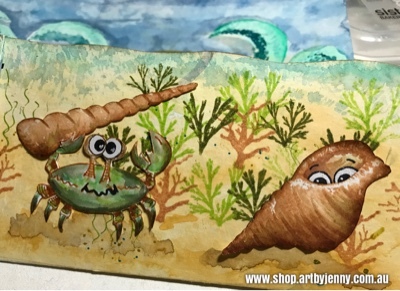 I wonder who's hiding inside the shell? 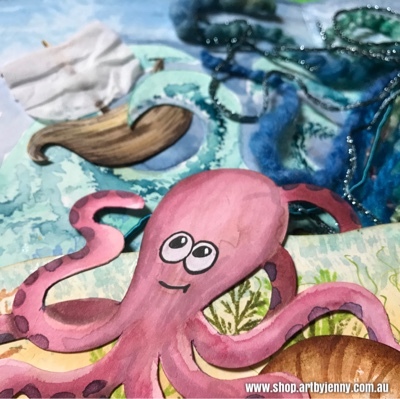 Looking up, the octopus realises he has a chance at being a kraken... but is too kindhearted to sink the ship! 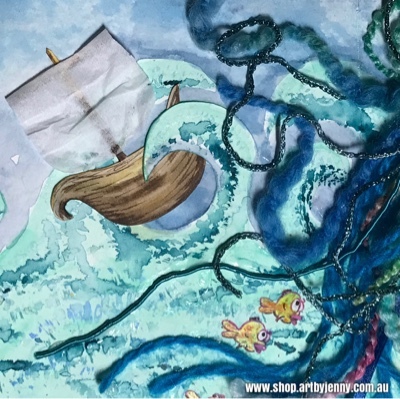 The ship is made from card and tissue, so light it floats, despite the huge waves crashing into it. With waves this wild and huge, the sailors are hiding below deck so we can't see them. Lucky really, because they'd be so tiny I'd need a magnifying glass to paint their little faces! 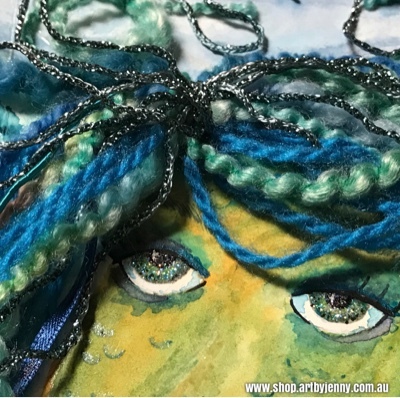 Calypso's wild mermaid coloured hair is made from yarns, cord and ribbon. 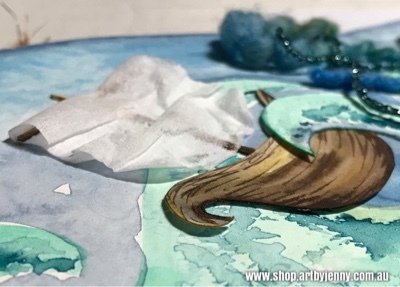 Each strand is carefully curled and attached in place using Glossy Accents (glue). Scales, Smooch and shimmery glitter glue (Diamond Icestickles) finish off Calypso's face. I'm so pleased with how this turned out, even if Calypso has an odd looking nose! With the flap folded up, it appears Calypso is hiding, ready for anything! It was a joy to create. I loved every minute! Darkroom Door and Dylusions cling rubber stamps, Wink of Stella, Sharpies and Tambi Gansai warercolour paints are available at my online shop, www.shop.artbyjenny.com.au.